Last week, the oldest synagogue in Washington, DC, was seen rolling through the streets of the Nation’s Capital. This wasn’t cheap entertainment provided during the federal government furlough–well, actually it WAS free and entertaining. 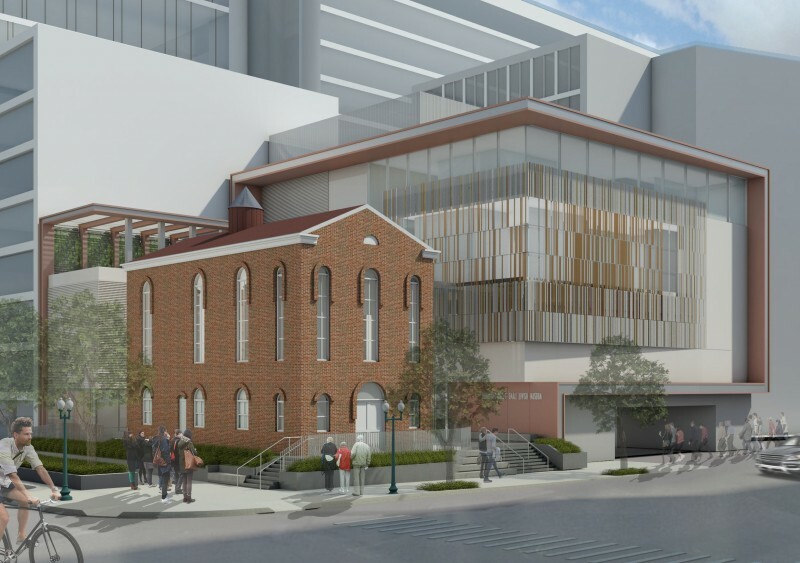 The journey was a major step in the development of a new Capital Jewish Museum, whose design will incorporate the 1879 building. A decent-sized crowd gathered to watch the wheeled building migrate from near the Supreme Court to 3rd Street NW. In fact, this was the third relocation for the Adas Israel synagogue. This motorized procession reminds me of a similar excursion made by the Girl Scout Little House in 1924. But that move was accomplished with actual horsepower, not heavy equipment. Built behind the White House in Washington, DC, for the second Better Homes Demonstration Week in June 1923, the Little House was a fully working home, with a modern kitchen, breakfast nook, three bedrooms, and a nursery. Between June 4 and June 10, 2,500–3,500 people visited the house each day. After the exhibition, the Better Homes in America and General Federation of Women’s Clubs offered it to the Girl Scouts for use as a national training and innovation center. The Girl Scouts were reluctant to accept. While it would wonderfully fit in with the Girl Scout program, accepting the gift would require a considerable investment. There were no funds for utilities, staff, insurance, and other operating costs. Most important, there were no funds available to relocate the building. The clock began ticking on the fate of the model home. The exhibit permit had expired on June 15, 1923. Lou Henry Hoover immediately saw the value in accepting the house and began working to persuade the Girl Scouts to accept. As national president of the organization, she began a barrage of letters and telegrams to national board members that lasted all summer. On September 20, the national board voted to decline the proposed gift. But Hoover refused to let the issue drop. She even offered to personally pay any deficit that might accrue in the first two years of operation. Considering the opposition we have had to meet in many quarters, particularly with the Camp Fire Girls and the Boy Scouts on this very matter of our home making propensities, or the lack of them, I feel that we must accept this, our justification, if possible. Meanwhile, Colonel C.O. Sherrill, superintendent of the Office of Public Buildings and Grounds, was continually pleading for someone to get the house off of government property. Mrs. Hoover asked the Secretary of Commerce, Herbert Hoover, to handle the concerned colonel. His reassurances helped little, as an increasingly desperate Sherrill offered his own solutions, including opening a Tea Room in the building to feed the many government workers situated in nearby offices. Ultimately, Mrs. Hoover grew tired of the back-and-forth and took matters into her own hands. She contacted Duncan and Marjorie Phillips, of the Phillips Art Collection, who agreed to loan a plot of land that they owned at 1750 New York Ave. NW. 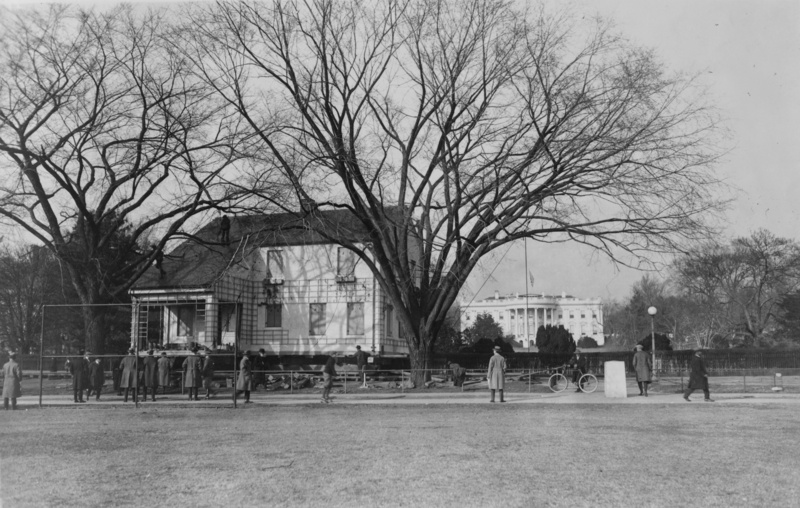 The new home for the Little House would be two blocks southwest of the White House and across the street from the famous Octagon House. Loading the Little House on rails (Harris & Ewing). Moving the Little House from its exhibition site to 1750 New York Avenue, NW, across from the Octagon House (Harris & Ewing). Hoover wanted her financial contribution to be anonymous, so she arranged for Henrietta Bates Brooke to sign the moving contract, as member of the National Executive Board. Edward G. McGill of Cumberland, Maryland, oversaw a crew of men who hoisted the house onto rails and pulled it to the new site. McGill charged $3,000 for transporting the house. Hoover also paid for a basement, utility connections, and landscaping, for a total cost of $12,000. Much to the relief of Colonel Sherrill, the Little House arrived at its new home in March 1924—nine months after the original exhibition. First Lady Grace Coolidge helped re-dedicate the building in a ceremony on March 25, as a beaming Mrs. Hoover watched. Lou Henry Hoover, wife of the secretary of commerce and national president of the Girl Scouts, paid $12,000 to relocate the Little House. 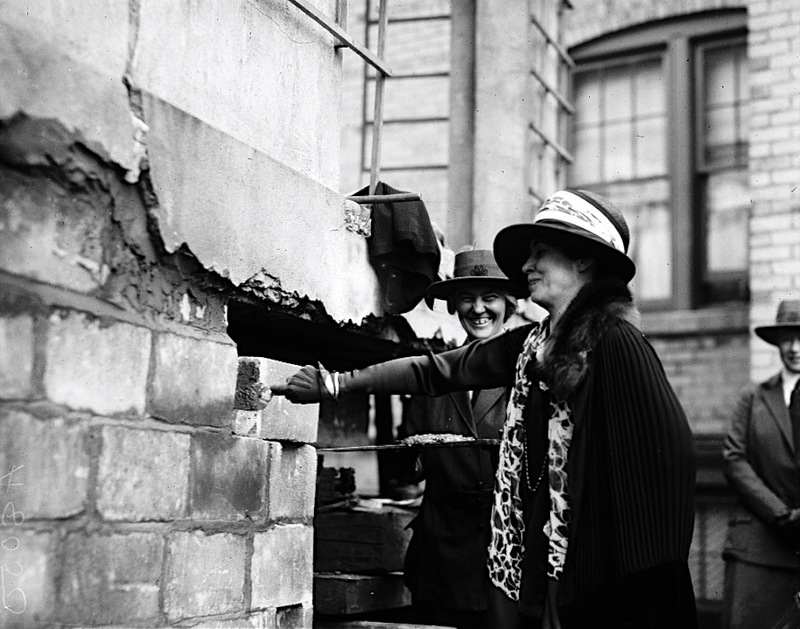 First Lady Grace Coolidge (right) laid the cornerstone, as Hoover watched. In the 1920s and 1930s, the Little House was THE place to go on Saturdays. There was always some badge activity to try or new skill to learn, and the First Lady, as honorary president of the Girl Scouts, might decide to drop by. After all, the White House was just around the corner. 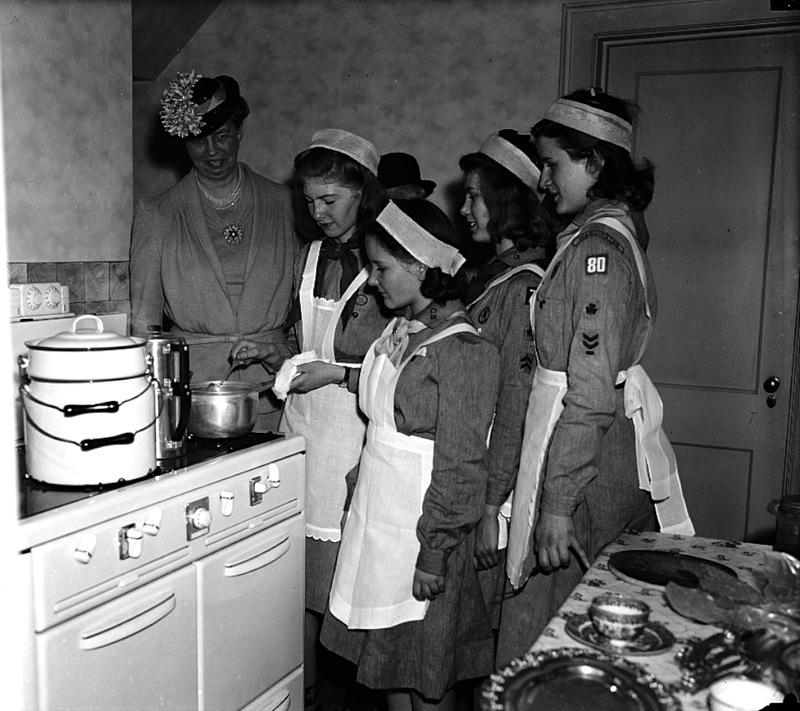 These girls are preparing lunch while their guest of honor, Eleanor Roosevelt, observes. It became the first of many “Little Houses” across the country, where Girl Scouts practiced their homemaking and hospitality skills. The Little House was used continuously for trainings and demonstrations of the domestic arts from June 1923 to April 1945. The building was used as a branch of Girl Scouts of the USA, the national organization, for the next decade then given to the landowners in May 1955. The Little House was torn down in the early 1970s. Need an inexpensive nature activity to kick off the Girl Scout year? New York City is recruiting volunteers to participate in a census of squirrels in Central Park this month. The Squirrel Census, an award-winning project dedicated to documenting Eastern gray squirrels, will count the furry four-legged creatures in Manhattan’s largest park from Oct. 6 through Oct. 20. The results of the data gathering will be released as a multimedia, interactive map of Central Park. Organizers prefer counters to be at least 14 years old, but younger children can participate with an adult partner. While this is the first census of Central Park, the Squirrel Census organization (yes, it really exists) has done two counts in Atlanta’s Inman Park and other smaller inventories. I’ve had bad experiences with park squirrels before. Yes, dear readers, it is time to share my squirrel story. I lived in London in 1990 and took regular morning walks through Holland Park. I usually stopped at the neighborhood news agent for a newspaper for myself and a small bag of peanut M&Ms for the squirrels. But one morning I arrived at the park and realized I’d forgotten the M&Ms. “No problem,” I thought. I certainly wasn’t going to make a detour for the squirrels. After walking down a path for a few minutes, I noticed this one squirrel who seemed to be scampering along with me. He would walk behind me, then scurry in front of me, stop and stand up on his hind legs, and stare at me. He did this four or five times. That’s when I realized, this squirrel RECOGNIZED me. He was WAITING for me. No, he was waiting for my M&MS. Then Mr. Squirrel decided to take matters into his own hands. Innocent looking squirrel from Pinterest. Don’t be fooled. He lunged at me, landing on the leg of my jeans. Mr. Squirrel clawed his way up my pants leg and STUCK HIS LITTLE SQUIRREL HAND IN MY POCKET. Yes, the pocket where I usually had M&Ms. He thoroughly rummaged his little squirrel hand around in my pocket looking for candy. That’s when I started yelling and kicking trying, to dislodge Mr. Squirrel. But he held on tight. I was yelling, turning in circles, kicking my leg, with a squirrel flapping on my leg. Finally, he turned loose. I swear he gave me a dirty look before scampering away. He also muttered something rude under his breath. I headed home, my jeans shredded and leg bleeding. But I vowed not to let Mr. Squirrel win, and the next day went out for another walk. In Kensington Gardens. I hope they tell the squirrels to keep their hands to themselves. The GSCNC Annual Meeting on April 13, 2013, included the council’s first Girl Scout Antiques Road Show. 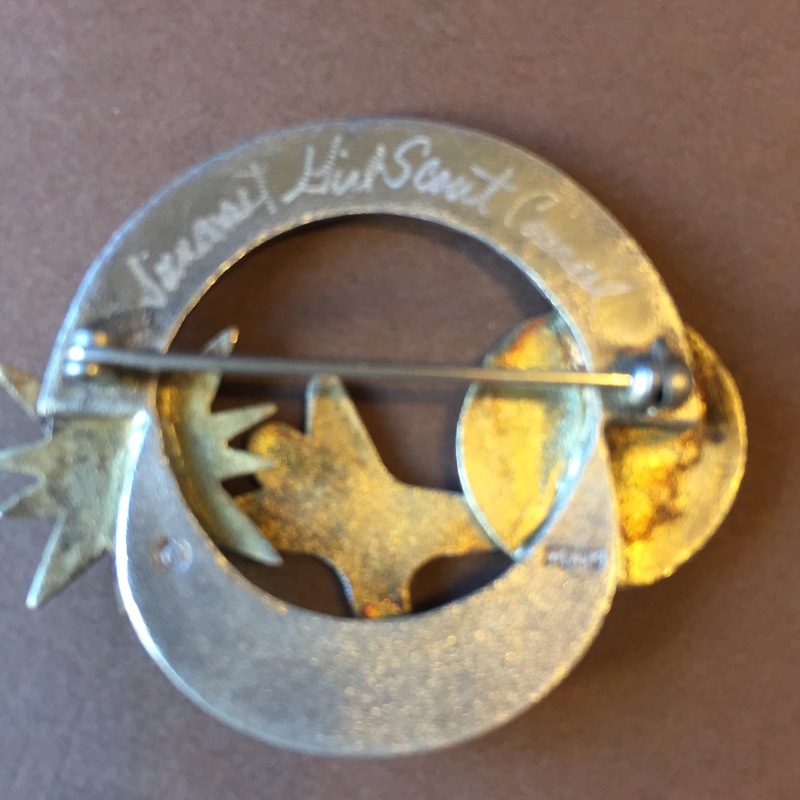 Members were invited to share their Girl Scout treasures and the stories behind them. 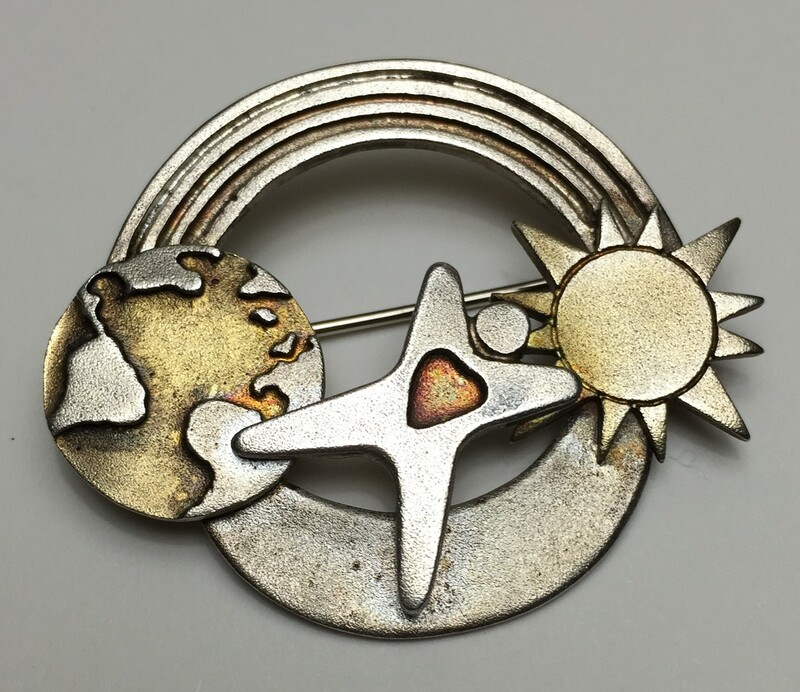 The Archives and History Committee helped identify a few curious objects. We hope to repeat the Road Show next year and have better audio for the 2014 video! 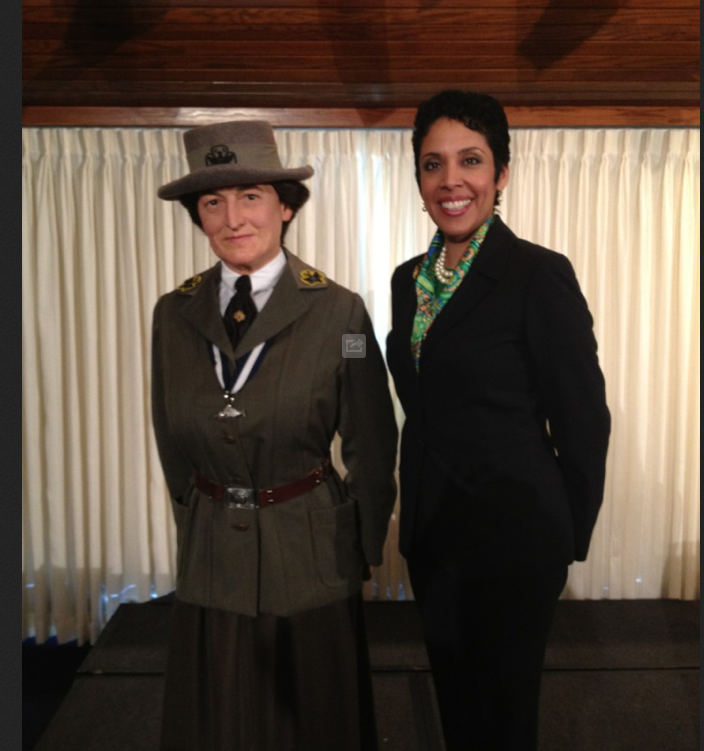 Girl Scout CEO Anna Maria Chavez visits Juliette Gordon Low at Madame Tussaud’s museum. 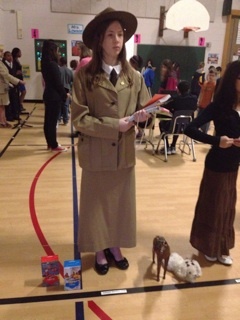 Madame Tussaud’s museum isn’t the only place near Washington, DC, to see a lifelike image of Juliette Gordon Low. The Committee has uniforms from various decades and age levels that troops can borrow. For the very earliest years of Girl Scouting, we have reproduction uniforms to lend. Leah completed her Daisy look with a badge book, a strand of pearls, several boxes of Girl Scout cookies, and a small horse and dog to indicate Daisy’s love of animals. She obviously has done her homework on our founder. Due to high demand, the Committee has revised its lending policy. Please see the “Dress Like Daisy” page on this website.